20 kilos of cocaine were discovered stashed inside a shipment of frozen fish. An unidentified importer, who was previously associated with a shipment of cocaine from Guyana earlier this year, has been linked to a haul of cocaine-in-fish netted in Brooklyn. 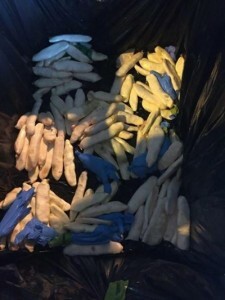 This time, the consignment originated from neighbouring Suriname and was trailed by United States (US) Federal agents to Brooklyn where two men were arrested while the fishy consignment of drugs was being offloaded. The New York Daily News reported that Triston Daniels and Troy Gonsalves were reeled in after 20 kilos of cocaine were discovered stashed inside a shipment of frozen fish. They were arraigned Saturday in Brooklyn Federal Court and released on $150,000 bail. The unidentified importer of the fish is located in Queens and was previously associated with a shipment of 82 kilos of cocaine from Guyana that was seized at the Miami airport in February, according to the court papers. The latest fish tale began May 4 when U.S. Customs and Border Protection officers seized an air cargo shipment of “large, frozen fish” from Suriname at Miami International Airport, according to U.S. Homeland Security special agent Ryan Varrone. Agents filleted the fish and removed the cocaine, which has a street value of about $600,000, according to authorities. The fish was replaced in the shipping boxes and transported by truck to a storage facility in Queens which was kept under surveillance, Varrone’s complaint states. Daniels, 32, and Gonsalves, 33, showed up at the warehouse on Friday in a white van. They picked up the boxes and drove to another storage facility in Brooklyn where they were arrested as they unloaded the van. Gonsalves admitted that Daniels told him that the shipment contained drugs, the complaint alleges.